Prior to last summer, I could not have imagined what life was like for those living in the Philippines. Although I had traveled before to many places, I had never seen conditions like that of the people living near our clinic. Most people didn't have electricity, running water, or even a solid house. Many of the people there just live under a few sticks with a thatch roof, literally. I would go for a run once or twice a week down the street from where we lived and worked. On the run, I would see these homes of people with the mothers carrying laundry to the river and the kids running around with old tires and sticks. This was everyday life for them. There were daily chores that Americans have not thought about in over a hundred years. We just live our lives in such a lucky set of circumstances to be given all that we have. I do not feel that the Filipinos are unhappy how their lives are because that is how their lives are supposed to be. I would not say their lives were any less pleasurable or meaningful than that of Americans or any first world country, but in the Philippines, the simpler and more important things in life stand out. I am currently a second year medical student at Tulane in New Orleans. At the time of the trip, I had just finished my first year, and knew very little about the clinical aspects of medicine. However, while working in the clinic, I was able to learn skills and perspective which I have been able to apply immensely to my curriculum thus far. Additionally, I intend to apply that same information throughout my career as a doctor. 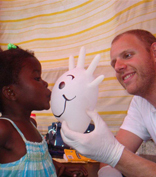 I was able to work for an entire month in the clinic allowing me to experience more than I could have ever imagined. I now feel comfortable with many of the aspects of medicine that used to seem so unfamiliar to me. I am not much of a writer, but I would have to end with one good memory I had while working. A young girl came into the clinic with a very high fever. She was fatigued and clearly not feeling well. To make a long story short, I assured the mother that we would help her daughter the best we could. I continued to give the girl an injection of medicine to reduce her fever and make her feel better. Although her fever did not subside quickly, I monitored her for a few hours, administering Tylenol when needed. The girl soon became more aware to her surroundings when her fever finally reduced to a more normal reading. Her mother was very grateful that we were able to help her daughter in her time of need. She was so thankful that she came back a couple days later with some coconut cookies that she had made for me. This story for me sums up the people of the region and they attitude for what we were doing by trying to help bring them some form of reliable health care. I would not have traded my experiences there for any. Nostalgia, I guess this word fairly summarizes my feelings now after 2 months of working in the Bicol Clinic. It was indeed the most vibrant, enchanting and phenomenal 3-week togetherness in all my life. To be in the team working for the poorest of the poor people of rural philippines allowed each one of us to explore the locale in unique ways. Working for them and living with them allowed us to learn their fabrics of lives. It was truly hugely educational. It is indeed the most powerful forum for American Medical Students to realize and feel the world out there and understand what it means by to have been born in the States and have things for granted. Dr. Schuster, one of the most humble men I have known, is yet another inspirational and towering figure from whom young people like me can learn much more in life while working in the Clinic. All the memories of the times spent there are reeling back in my mind now as I am writing. It was such a great fun and working that I truly treasure the opportunity I was provided. On an average we used to examine 150 patients a day, which is actually a lot less than what we were used to here in Nepal and it was largely due to language barrier ( Translators were amazing and great, without them we would have died! ) and we had students with us...to whom we again had to explain everything. Tropical and Infectious diseases were the commonest diagnoses while new and interesting cases always popped up now and then. I had never seen so many hypertensive patients, like in the Clinic. For those students who see themselves as a Surgeon in the near future, coming to the Clinic would be an excellent excellent forum for hands-on-training. I bow to the enormous amount of work American Nurses do on their own! It was an opportunity for me to learn American ways too! We certainly shared our cultural beliefs and practices and educated ourselves. The weekends used to be a lot of fun with short hikes, Swimming ( We had to have a life-jacket), Dancing ( I danced second time ever with a girl there) Barbecue, Boating, Games and many more.I never felt like working while there, it was always learning using all of the senses and weekends making us feel like we are on a Vacation! Some of the top tourist destinations of Philippines are not too far from the Clinic, we were fortunate to pay a visit there. The region of Philippines where we went was one of the poorest regions of the Country. Having reached Manila, one's impression of Philippines would be that of American Skyline with Skyscrapers, Huge Malls, and Clean wide highways. I had adequately read about Philippines before I flew and thus was aware of the unfathomable difference between Haves and Have Nots. Having 1/3 of the population below international poverty line of Less than a Dollar a Day and skyrocketing price of Medicine and extremely cheap Cigarette and Alcoholic Drinks, the Filipino Government and multinational Companies are truly robbing off the public. And these are repercussions of Dictator Marcus in the 80s. Yet I found Filipinos very much warm and hospitable. Thus I conclude, it is very important for every youth to travel to new places and learn. This allows one to be open to world cultures and values that you otherwise consider alien. Bicol Clinic is the excellent forum for students and allows one to have a vacation and Be Part of the Start.